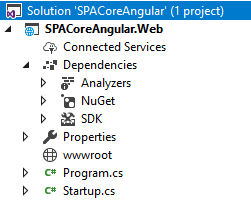 In this post, we are going to explore how a Single Page Application (SPA) sample can be put together using ASP.Net Core & Angular from scratch. We are going to use Angular6, TypeScript in the frontend and in the backend we'll be using ASP.NET Core WebAPI with Entity Framework Core database operations. Following are the prerequisites to develop our SPA sample. If you already have a copy of Visual Studio 2017 installed don’t worry, otherwise download Visual Studio Community 2017 for free. Install the .NET Core SDK (Software Development Kit) 2.0 or later. Make sure the environment is ready before stepping into this. Let’s create a new project with Visual Studio 2017 > File > New > Project. Choose empty template click > OK.
Here’s our new ASP.Net Core empty project with initial components. In this sample, we are going to serve the index.html page as our main page from app root folder, to serve the page we need to configure in Startup.cs file. Here is the code snippet which is going to serve the page. Let’s add frontend packages to our application. We need to add npm configuration file named package.json. To do that right click the project then Goto > Add > New Item. From the new item add window choose npm Configuration File. 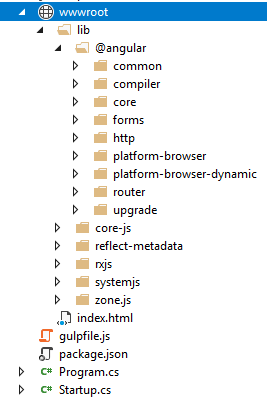 Here’s our list of frontend package dependencies. After installation of all packages let’s transfer the required libraries from node_modules folder to “wwwroot/lib” for calling it to the main HTML page. We need to add a task runner like gulp file, then copy below code snippet and paste it into the newly added file. Right click on gulpfile.js then go to “Task Runner Explorer”. From the new window, refresh the task, then right click on the task to run it like the below screen. 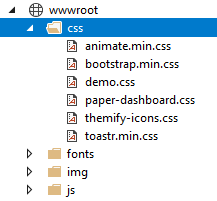 As we can see our required libraries are loaded in “wwwroot/lib” folder. In this section, we are going to add a basic Bootstrap template to our main HTML page. Below is our folder structure for the sample app. As we can see 'clientapp' is the root folder that consists of entry point file & root module. 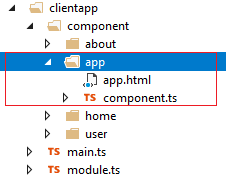 Root module has app component where other components are related to root module through app component. To enable an ES6 new feature we need to resolve dependencies. core-js: For es6 features to browsers. Here’s our application loading to the browser by System.import() function. Before importing module we need to configure SystemJS by using System.config() function we are going to define which package/file to load. Every application has a root component which has two part annotation and definition. It has a selector to match with main HTML page to render. 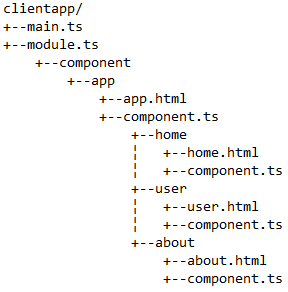 This is where our application components are defined, a module may have multiple components. Every application has a root module. Let’s create a main entry file, name it main.ts. Copy below code snippet paste it to newly created typescript file. At this point our application is bootstrapped and launch the root module in browser. Here's how we are bootstrapping our application in index.html page. Let’s build and run the application. Our application is running, as we can see the upper screen is appearing with a welcome message. Next, we will create form then submit & validate after that we are going to perform CRUD operations with SQL Database. Let’s Create a Database in MSSQL Server. Here is the table where we are storing data. Run the below script in a query window to create a new database. Entity Framework (EF) Core is data access technology which is targeted for cross-platform. Let’s right click on project then GoTo > Tools > NuGet Package Manager > Package Manager Console install below packages one by one. Database Provider, that allows Entity Framework Core to be used with Microsoft SQL Server. Design-time, that allows Entity Framework Core functionality (EF Core Migration) to be used with Microsoft SQL Server. We are going to generate EF models from existing database using reverse engineering using a command in Package Manager Console. As we can see from solution explorer models folder is created with Context & Entities. Now, open the DbContext file then add a constructor to pass configuration like connectionstring into the DbContext. // #warning To protect potentially sensitive information in your connection string, you should move it out of source code. See http://go.microsoft.com/fwlink/?LinkId=723263 for guidance on storing connection strings. In Startup.cs let’s add our DbContext as service to enable database connection. Here’s our ASP.Net Core WebAPI Controller using specific RoutePrefix attribute globally. With this api controller class we are performing a database operation using Entity Framework DbContext. All right, our WebAPI is ready to interact with the database. Our next step is to prepare client model, component and services to interact with WebAPI’s. Let’s get started with form design. There is two strategy of Angular6 form, in this sample, we have used Model-driven form. Below is our UserComponent that is interacting with UI, validating form then sending/receiving data from service component. Import the component function from Angular6 library; use of "export" means app component class can be imported from other components. Below is service component which will get called for each operation performed by UserComponent. In our UserService we have Http service [Get, Post, Put, Delete] that connect with WebAPI to perform Create, Read, Update & Delete operations. Now it’s time to build & run the application. Let’s try to perform the CRUD operation using the system. As we can see from the below screenshot data is loading in user page from database. In this sample, we had to combine ASP.Net Core & Angular to create the sample SPA app without any CLI, and learned how to start with an empty ASP.Net Core application to serve static HTML page. We also have taken a deep dive into the latest frontend technology like Angular6 from scratch to build a single page application. We had a short overview on Angular6 dependencies & also learned about the module and components. Then we have performed some database operation using our sample application. Hope this will help.